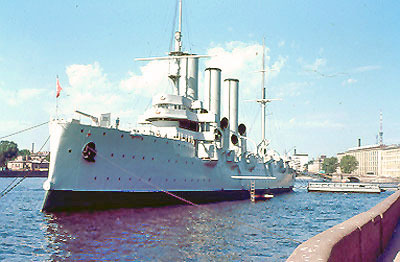 The Cruiser Aurora still at dock in St. Petersburg. A shot from the Aurora was the signal for the Bolsheviks to launch the "attack" on the Winter Palace in the October Revolution. I remember walking up to the cruiser and taking a closer photograph. Read the textbook chapter 34 and pages 487-503 of chapter 36. Check the remarks by Professor Blois and Professor Evans on the 1917 Revolutions and ensuing civil war. Read Professor Thomas Hammond's notes on the Civil War period. These are divided into three parts: The Civil War, the Civil War & Intervention (bit of an overlap between these first two) and then specifically the American Intervention in Russia. (*.pdf files). I also have Hammond's extensive notes entitled "Why Did the Provisional Government Fail?" (*.pdf file) I remember Hammond telling me about Aleksandr Kerenskii, who must have visited the University of Virginia at some point in the 1960s to give a lecture. Hammond recalled later to me how he had badgered Kerenskii about his actions in 1917 with questions of the sort, How could Kerenskii not have realized that continuing the war effort set the stage for the Bolsheviks? How could Kerenskii not have taken more vigorous action against the dangerous Bolsheviks? Hammond told me that Kerenskii resignedly tried to answer these things, but Kerenskii also realizing that Hammond just could not have appreciated the situation as it was in Russian in that exhilarating year of revolution. Hammond regretted his overly active questioning of the then-aged Kerenskii, who had been hearing the same kind of accusatory questions for over fifty years in exile from Russia after the Bolshevik takeover; everyone blaming Kerenskii for the failure of the liberal alternative in Russia in 1917. Ever wonder why the new Bolshevik regime did not get along well with the rest of the world. Professor Hammond had a short lecture in which he explained some of the reasons for that hostility. (*.pdf file). You can also read the account of Bolshevik activities in Siberia during the Civil war that was published by John Embry. On one had, the account is a good example of the hysterical publicity that the Bolsheviks generated in the United States and Western Europe. On the other hand, the account is a good indication of the savagery with which the Russian civil war was waged. For a maximum of 50 points extra credit, watch Reds and assess the historical accuracy of the film in a one-page paper. For a maximum of 50 points extra credit, watch Oktiabr (October; Ten Days That Shook the World) and assess the historical accuracy of the film in a one-page paper. For a maximum of 50 points of extra credit, read Mikhail Sholokhov (1905-84), And Quiet Flows the Don (1929) Tikhii Don (Quiet Flows the Don) and explain the impact of the Civil War on Russian society, in a one-page paper. For a maximum of 50 points extra credit, watch Chapayev and assess the historical accuracy of the film's portrayal of the Russian Civil War, in a one-page paper. For a maximum of 50 points extra credit, watch Konets Sankt-Peterburga (The End of St. Petersburg) and explain the ideological purpose of the film, in a one-page paper. For a maximum of 50 points extra credit, watch Potomok Chingis-Khana (Storm over Asia) and tell me why you watched it, in a one-page paper. For a maximum of 50 points extra credit, read John Reed's Ten Days That Shook the World (free at www.bartleby.com/79/) and explain Reed's explanation of why the Bolsheviks were able to seize power successfully, in a one-page paper. For 50 points maximum extra credit, watch Red October and answer the following question on the movie, in a one-page paper: What film techniques were used in this film to give a specific interpretation of the events of the Russian Revolution? For 50 points maximum extra credit, read Bertram Wolfe, Three Who Made a Revolution: A Biographical History (1948) and write a one-page paper comparing the work of Lenin, Trotskii and Stalin in 1917. For 50 points maximum extra credit, read N. N. Sukhanov, The Russian Revolution, 1917: A Personal Record (1955), one of the most important eye-witness accounts of 1917, and write a one-page paper explaining Sukhanov's thoughts about the course of events in 1917. For 50 points maximum extra credit, read Sheila Fitzpatrick, The Russian Revolution (1982) and write a one-page paper in which you establish the author's main thesis about the Russian Revolution. For a maximum of 25 points extra credit, read Order Number 1 (also at Marxists.org but not as good a translation) issued by the Petrograd Soviet on 1/14 March 1917 and assess its historical importance in a long paragraph. Note that there was also an Order Number 2 (*.pdf) issued to clear up any misunderstanding of the intent of Order Number 1. For 25 points maximum extra credit, read the remarks on the Russian Revolution by Robinson and Beard (1921) and write a paragraph comparing to the coverage of the Russian Revolution in the Riasanovsky textbook.